We’re excited to show you this fantastic installation we completed last month in Kexby, just outside York. 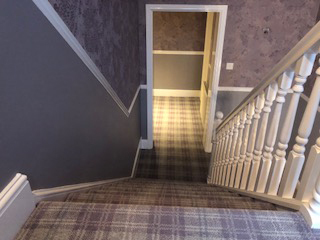 The choice of flooring for the hallway, stairs and landing combines the contemporary ‘of the moment’ colourways with traditional patterns to create stunning look which adds instant character. The range is a woven axminster from Ulster Carpets called Braeburn in Sea Holly and we think you’ll agree that it instantly brings a sense of warmth and cosiness. 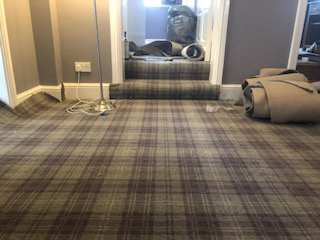 The Braeburn collection uses the traditional plaid design but has been combined with heathery purples, petrol blues, mossy greens and shimmering greys to create a contemporary yet timeless floorcovering. The accented pastel shades create a rich tapestry of colours reminiscent of British coastlines, wild hedgerows and vast moorland, conjuring up images of silvering driftwood, glistening blue seas and waxy leaves. 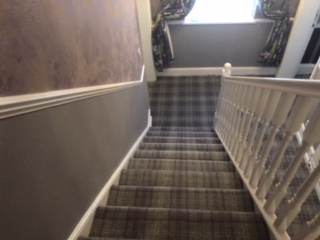 The collection is one of many modern takes on traditional patterns that Ulster Carpets produces. The company was founded by George Walter Wilson in Northern Ireland in 1938 and is still privately owned by the founders family. All of their wilton and axminster carpets are still manufactued in Northern Ireland in one of the most technologically advanced carpet weaving plants in the world… in fact in recognition of the advanced weaving technology developed here, Ulster received the Queen’s Award for Enterprise. 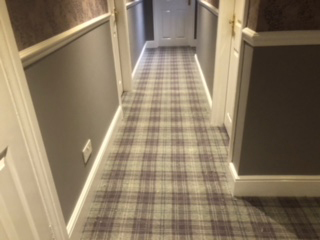 Ulster Carpets has taken the positive attributes associated with being a family business and combined them with a forward thinking, global approach to business and is one of our favourite suppliers here at Buckley for Flooring. We have all the sampling in store so why not pop in and see the colourways for yourself?